Third-Party Assessment｜Toyoda Gosei Co., Ltd. The Toyoda Gosei Group has gained consistent recognition for its Group-wide environmental activities. The Group will increase its activities for further improvement based on these assessments. Tenth place in Environmental Management Survey 2018 corporate ranking by Nikkei, Inc. In the corporate ranking of the 21st “Environmental Management Survey,” which assesses companies’ efforts in improving both environmental measures and operational efficiency, Toyoda Gosei was ranked tenth in the manufacturing category. This survey by the Nikkei Shimbun has been conducted every year since 1997. Companies’ environmental management is comprehensively analyzed, and they are evaluated for their progress in improving both environmental measures, such as greenhouse gas and waste reduction, and operational efficiency. The survey this year included leading publicly traded and privately held companies (1,724 manufacturing companies, 1,357 non-manufacturing companies). Toyoda Gosei received a ranking of “A−” for leadership level for our CO2 reduction activities and other efforts to combat climate change in the 2017 CDP Report published by CDP, an organization that ranks companies’ efforts in fighting climate change and providing information to institutional investors and others. Toyoda Gosei was recognized for the medium-term targets in its 6th Environmental Action Plan and TG 2050 Environmental Challenge. * Formerly called the Carbon Disclosure Project. It is an international NGO that seeks disclosure from companies on their environmental strategy, greenhouse gas emissions and other matters. The CDP index has one of the greatest impacts on a company’s environmental ranking. Toyoda Gosei was ranked third in the transportation equipment sector of the “Corporate Anti-Global Warming Measures Ranking” conducted by WWF Japan (2015). WWF Japan ranks each company’s efforts using 21 indicators, including long-term vision, units of reduction, energy-saving targets, renewable energy targets, difficulty of total reduction targets, understanding and disclosure of emissions volumes of entire LC, and third-party assessments. Toyoda Gosei was recognized for its steady progress in the use of renewable energy, including the introduction of quantitative targets, an area that holds the key to energy savings and anti-global warming measures. 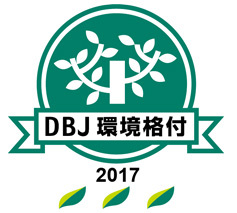 In the “DBJ Environmentally Rated Loan Program” of the Development Bank of Japan (DBJ), Toyoda Gosei received the highest rating for its advanced efforts in environmental friendliness. The company was noted especially for its efforts to minimize CO2 emissions and develop environmentally-friendly processes and equipment based on a cross-sectional and global system headed by the company president, and for its efforts to improve the fuel efficiency of automobiles in terms of both lighter weight and higher performance through the development and design of easily recyclable products and materials over the entire lifecycle. * A rating system developed by DBJ to grade the environmental management level of companies, select outstanding companies, and apply loan interest rates in three levels in accordance with the score.